Fractal diagrams depict the forces of chaos in the world of mathematics as well as the real everyday world, such as occurs in patterns of growth or weather. Chaos is what the alchemists called their First Matter, and it was the source of all transformative energy. Breaking down everyday reality into its chaotic underpinnings and then reassembling that energy into something more perfect or higher in spiritual expression was what alchemy was all about. It is the meaning of solve et coagula. FractalSaver is a free screen saver for MS Windows. It calculates either the Mandelbrot or the Julia Set in 2d or 3d, or then shows the Hopalong fractal in the original version and in some modified versions. Put the file into your windows directory (usually c:\windows) and select it as your screen saver in your control panel. From Peter M. Geiser. Double Fractal is a fractal manipulation program that allows you to manipulate and change coloring and other properties of fractals to print or save to file. Fractal Explorer is a zipped folder containing a viewer that allows you to control the size, timing, and depth of fractals. 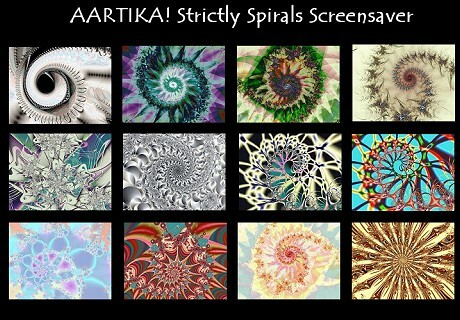 Aartika Fractal Screen Saver contents are shown in the chart below. Other fractal screen savers are available from the Aartika website.